Dr Safvat is actively involved in the management of acute Hand Trauma, both in the public and in the private sector. Hand conditions are an area of special interest to him and he has gained a lot of experience in both Elective Hand Procedures and Hand Trauma. He works closely with hand therapists to optimise the recovery of his patients after an injury. Hand injury can vary from minor laceration to a crushed and mangled hand. 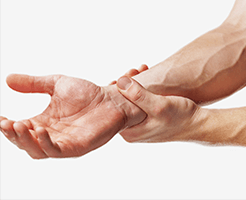 The most common acute hand injuries treated by Dr Safvat include injuries to the tendons, nerves, joints, and blood vessels; fractured bones; burns, lacerations, amputated fingers and other injuries to the skin. The aim of surgery in all cases is to get the quickest and best possible functional results for the patients’ hand. At times this may require complicated replantation of an amputated finger at other times a simpler procedure will get the patient back on with their lives quicker. In all cases the options are thoroughly discussed with the patients before the surgery and their wishes taken into the account. Post operatively, the hand and wrist is usually wrapped in a bandage and splint (plaster). Patients are discharged with a sling to elevate their hands and usually on some antibiotics. The dressing needs to stay dry and intact for one or two weeks after the surgery, depending on the severity of the injury. Hand therapy will be organised after that. Dr Safvat will follow his patients regularly to ensure their continuous improvement and recovery.